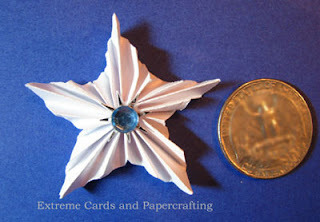 If you enjoyed making the larger (3") pleated paper star, try this one! It is tiny, but it's not ridiculously tiny. 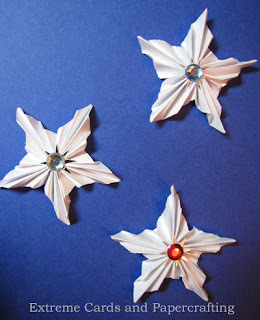 Perfect to use in a grouping on the front of a card or as a scrapbook embellishment. Assembly is the same as for the larger accordion pleated star. I added a small silver sunburst and a jewel to the center of each of mine.